Portal Zine - Before the shooting, Charlie Hebdo has recently launched on the cartoon militant group leader of the Islamic State (IS / ISIS), Abu Bakr al-Baghdadi. Violence against satire magazine is not the first time this has happened. In November 2011, the magazine's office the day after the bomb thrown at present caricatures of the Prophet Mohammed. Knowing office shooting action against Charlie Hebdo, French President Francois Hollande visited the shooting scene. He is scheduled to hold an emergency meeting to discuss the shooting. French police issued a warning to all media in the country to be aware of the possibility of a subsequent attack. Stephane Charbonnier was killed on Wednesday (7/1) in his office. He is one of 10 journalists and cartoonists who was shot dead by armed men wearing masks, in a shooting in Paris. At least 12 people were killed in the attack on Charlie Hebdo offices, including the chief editor, Stephane Charbonnier. Targeting foreign journalists by ISIS and other extremist groups have led to gruesome murders during the past few years. Free speech activists have condemned the latest attack them and refer to it as an attempt to intimidate journalists in Europe and throughout the world. Dr. Courtney denounced the notion that 'Charlie Hebdo' as a media satire that provoke controversy - even offended - do not deserve the same protection that is given to all the other reporters. He cited the work of satire that often make uncomfortable world leaders, including governments in the Middle East. "We have seen this in Egypt where Bassem Youssef - John Stewart of his Egypt - has now been forced to not broadcast, we've seen it in an attack on cartoonist news around the world. In fact, journalism appears in various forms and each person has the right to express themselves, "said Dr. Courtney. Almost nine years ago, the US media, Harper's, reissued an essay that contains some offensive cartoons of the Prophet Muhammad, including images of Denmark. Harper's president, Rick Macarthur, who approved the issuance of the essay, say, anti-Semitic cartoons are also among the cartoons are displayed again. "At that time, there was an anti-Semitic caricature contest in Iran and Israel that we have learned," he said. He then explained, "But what he said very clearly and distinctly, and what I agreed today is that the present understanding of open discourse and oppressive images gives them a power too great." In 2012, 'Charlie Hebdo' published drawings of the Prophet Muhammad, who pushed the White House to defend the right of the newspaper to publish it. "No matter how offensive it like this, violence is not justified in any way," he added. In response to attacks on journalists 'Charlie Hebdo', US President Barack Obama delivered his direct assessment on the motivation of the armed groups. "In fact, this is an attack against journalists, attacks on free press," the north. "But one thing that I believe, that the values that we understand together with a French citizen, a conviction - a universal belief in the freedom of expression, is something that can not be silenced because of senseless acts of violence carried out a handful of people"
Post brutal shooting in the office of Charlie Hebdo, the Danish newspaper Berlingske will republish the caricatures of the French magazine. It is part of the review brutal incident that killed 12 people in Paris. As reported by Reuters on Thursday (08/01/2015), Berlingske print edition published on Thursday (8/1) local time, which is also available online, featuring some of the front page of Charlie Hebdo have been published previously, which would display the typical caricature of the satirical magazine . One of them caricatures of the Prophet Muhammad and a number of other caricatures of Islamic law. Such caricatures previously angered Muslims when published by Charlie Hebdo. 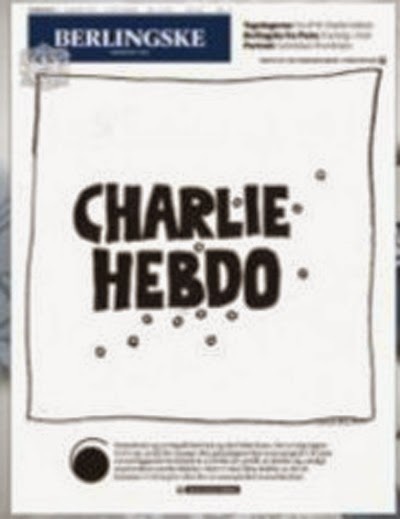 When asked about the republishing of this caricature of Charlie Hebdo, editor in chief of the newspaper Berlingske, Lisbeth Knudsen called this not a form of protest. "We will reprint it as documentation to show what kind of magazines (Charlie Hebdo) which has been hit by this terrible event," said Knudsen told local news agency, BNB. Not only Berlingske, Italian media the Corriere della Sera newspaper that is well-known in Italy as well do the same. In the video editorial on Wednesday (7/1), it said it would publish the daily return of Charlie Hebdo caricatures. Other Danish newspaper, Jyllands-Posten in 2005 published a 12 cartoons from various artists, mostly depicting the Prophet Muhammad. This sparked a wave of protests from the Muslim world and led to the incident that killed 50 people at that time.